Why is excessive alcohol consumption bad for your liver? How do these excesses impact your health? My Liver Exam, with the help of Liver4Life, gives you some tips to understand the issues linked to alcohol. First, we need to understand how the liver is affected at the beginning. Aside from the sluggish, hangover feeling that you get when you drink too much, alcohol can cause serious damage to your body’s epicenter, factory and beholder of the best filter in the world – your liver. 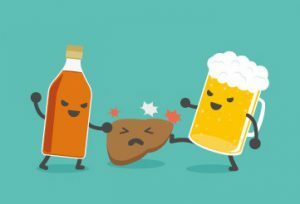 Although a resilient and hardy organ, your liver can be affected by too much alcohol (as well as too much fat, viruses and other ailments that we end up with). While undertaking its daily repertoire of all of its jobs for the body, perhaps it’s most well known party trick is its ability to filter all the blood in your body and remove all the toxins that you consume. However too much of any alcohol toxin can cause serious damage to the liver if consumed in high quantities. This is because the alcoholic toxin has a habit of building up faster than the liver can process it. Over a sustained period of time, this build up can cause a liver inflammation, the death of liver cells, and the development of scar tissues (fibrosis), implying harden of the liver. This process can evolve into cirrhosis. The evolution of the disease goes through different stages, including liver inflammation, death of liver cells, and gradual progression of fibrosis (accumulation of scar) until the stage of cirrhosis. These stages are generally reversible; however they require complete removal of the alcohol toxin, for a sustained period of time. Once advanced (decompensated) cirrhosis develops, it can lead to liver failure. One fact to remember from this article: the liver can regenerate in as little as three days. * This has been shown in cases when a large part of the liver has been removed (usually for transplantation) and the liver restores itself to almost full size in a few days. For people that do drink regularly, we would advise at least three days off alcohol. However, you must remember that the time of recovering depends on several factors for each individual: weight, alcohol resistance, way of life, etc.. When explaining the liver’s amazing capability to regenerate, we tend to use an analogy that likens the liver to the human skin. They’re very similar in many ways; they are able to regenerate new cells. For instance, if you burn your skin, it will heal and the liver is the same. However, unlike your skin your liver has very few nerve endings. You tend to know when you have burnt your skin because you can feel it and it generally hurts, but it is unlikely you will feel any pain if you damage your liver. In conclusion, if you are worried about your alcohol consumption or the health of your liver, visit your GP.